A crystal structure consists of a basic atomic motif that is repeated in 3D space according to the symmetry operators of the crystallographic space group. The crystallographer determines the 3D coordinates of the atoms in this basic motif or asymmetric unit and the extended crystal structure then follows by application of the space group symmetry. Often (ACACTA, Figure 2 opposite) the asymmetric unit comprises a single molecule of the compound under study. Here, in CSD terminology, the asymmetric unit and the crystal chemical unit are synonymous. Two (or more) independent molecules of the same chemical compound (as in AANHOX, Figure 3). Two (or more) different molecular or ionic species, e.g. a solvent of crystallization or counter ion may be present, or the compound is a clathrate or molecular complex (BIRDIP, Figure 4 opposite). In the CSD and its associated documentation, we use the term residue to describe each independent bonded unit or ion in the crystal chemical unit. Thus, AANHOX has a crystal chemical unit that consists of two discrete residues. 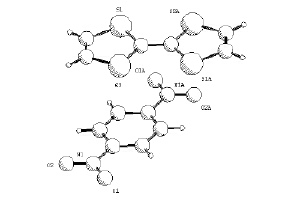 In this case, the two residues are chemically identical, but will exhibit slightly different 3D structures. Finally (BIRDIP, Figure 4 opposite) the asymmetric unit may consist of some fraction of a complete molecule or molecules. In these cases, the point symmetry of the molecule(s) coincides exactly with an (appropriate) symmetry element of the space group (mirror plane, 2-fold axis, etc). In BIRDIP (Figure 4), which is a two residue molecular complex, the 2-fold point symmetry of each residue is coincident with 2-fold axes in the space group. This means that the crystallographic asymmetric unit contains one half of the p-dinitrobenzene molecule and one half of the tetrathiafulvalene molecule. The atoms of the asymmetric unit are denoted as e.g. N1, O1, C1, S1, etc., in Figure 4. The molecules are completed by symmetry atoms, N1A, O1A, C1A, S1A, etc., that are bonded to the asymmetric set and whose coordinates are obtained by application of the 2-fold axis element of the space group symmetry. For structures like BIRDIP (Figure 4) the CSD contains explicit 3D crystallographic coordinates for the two complete molecules. 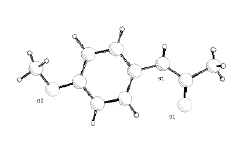 These complete molecules (residues), taken together, now form the CSD crystal chemical unit for this type of structure. Thus, the CSD contains details of two types of atoms: asymmetric unit atoms (no alphabetic suffix on the atom label) and symmetry atoms (the alphabetic suffix relates to the space group symmetry operator used in their generation). A set of matching numbers maps the `chemical' atoms of the 2D connection table onto the `crystallographic' atoms of the 3D structure. This explicit handling of symmetry situations removes the need for users to be over-concerned about the symmetry aspects of crystal structures, while retaining essential information for use when necessary.